Owl Mania. 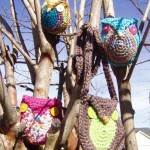 Crochet pattern for stuffed owl and purse. Pyramid Gift Box Pattern. Knitting pattern for a simple gift wrap. Di-Vine Yoga Socks. Knitting pattern for a simple pair of yoga socks with embroidered embellishment. Nesting Birds. 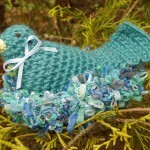 Crochet pattern for a bird and its nest. Nest can also be a bowl. 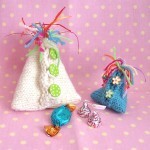 I have just uploaded four of my patterns to the FREE Patterns page here on my blog! Be sure to check ’em out! J’aime beaucoup les sacs hiboux, ils sont vraiment trognons! Et l’oiseau est vraiment joli! Que de belles choses.